Sandy Daza tries the lomi at Panciteria Lipa. So ok! The obvious question is what in the world was I even doing with renowned chef and restaurateur Sandy Daza. I had been seeing teasers of his new show on the Lifestyle Channel called ‘FoodPrints.’ I cannot say that I knew an awful lot about Sandy, but he is the son of the late Nora Daza, whose column ran in a local paper, like, forever! As it happened, the show’s producer Jennie Celdran – wife of ANC personality David Celdran – happened to be a friend of my former colleague Ningning Doble. Ningning was part of the staff of my friend and former colleague Cora Abansi, and in fact I went to see the two ladies in Baguio only last June. Jennie had asked Ningning for an initial contact for the show’s impending Batangas Province shoot; and the latter promptly referred her to me because I also maintain another site called Food Batangas. I was quite happy to be of help. 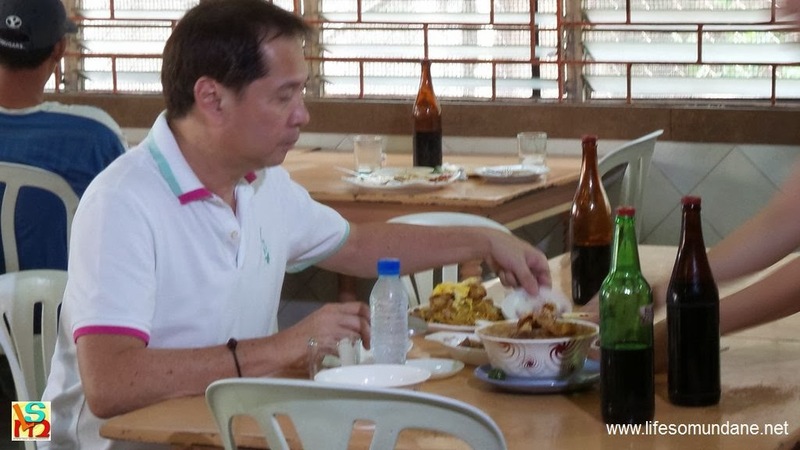 Initially, communication exchanged between Jennie and I was limited to things that she and her team could possibly feature in the Batangas episode of FoodPrints: who invented Lipa lomi; which were the best joints; what was gotong Batangas; where was the best bulalo; and so on and so forth. As the production team’s itinerary became clearer, Jennie asked me if I was willing to join them and probably go on-cam with Sandy. I was not sure about the on-cam thing, but Batangueño hospitality dictated that I, at least, said hello to the team. Not only that. I was also interested to see how those delightful documentaries that they show on the Lifestyle channel are produced. So, I said yes, I would be joining the team. 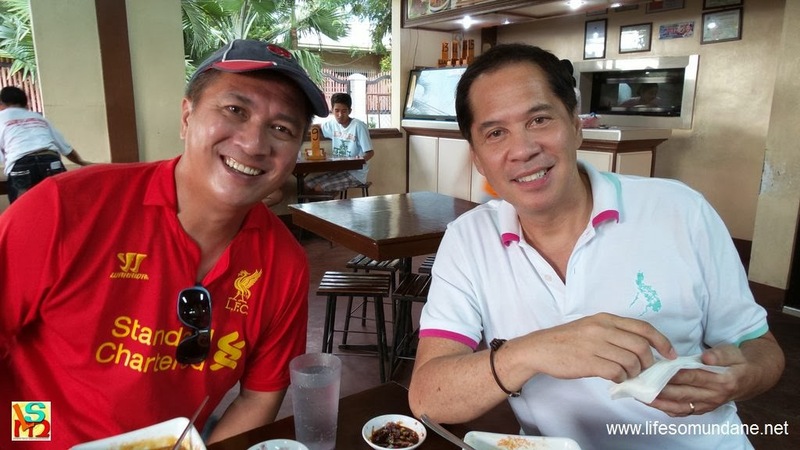 Last Sunday afternoon, I caught up with the production team at the Panciteria de Lipa, where naturally they were covering the original home of the famous Lipa pancit lomi. I was actually in very familiar territory because meeting up with people and showing them around the place used to be my job when I headed DLSL’s External Affairs. I had dressed casually as I always do, so finding the entire team dressed just as casually eased my concern about possibly having under-dressed. Sandy Daza himself wore a white collared t-shirt, blue denims and sneakers; quite unpretentious, as a matter of fact. I found him down-to-earth and very pleasant. I was pleased to have been reacquainted with Mrs. To, the owner of the panciteria. Several of her children were my students. I might have met her once or twice in the old days in school. Those who live in Lipa know that the panciteria is alternatively known as ‘Timing’s.’ Now, how many of you know that Timing was To Kim Eng, her late husband who invented the original lomi? I was always under the impression that Timing was Mrs. To! This was going to be an interesting afternoon. I followed the team up to the fourth storey where it was allowed to shoot the making of the panciteria’s own miki noodles. An acquaintance who was also one of the team’s local contacts went to see how the miki was made, too; and we were both of the opinion that this was something few Lipeños are privileged to see. Sandy was game and tried his hand at the miki manufacturing process. I swear kneading the dough was not easy; but the workers made it look so. It was also hot and stuffy as well. I was expecting the cameramen to be lugging along these large cameras like the sort you see on television all the time. Instead, the two cameramen shot using these modern dual-mode digital cameras which can take videos at 1080p resolution. The takes were quickly downloaded onto a Mac for on-the-fly inspections during lulls in the shoot. Anyone whose voice had to be recorded was given a miniature lapel microphone to tape onto his body inside the shirt. I found everything so fascinating. After the panciteria shoot, the production team wanted to cover Traveller’s Lomi in Pangao. This was where I came in. I was the designated guide. I rode with Sandy and Jennie and learned that they were contracted to do an initial six episodes with the option to do more. Depending, I suppose, on how the show performs in the ratings game. Of all things, however, when we arrived at Traveller’s, what greeted us was this crudely made sign that said that the place had closed for the day because there was no more lomi. I talked to the proprietor and explained that the Lifestyle Channel team wanted to feature the place for a television show; but she politely explained that, much as she wanted to accommodate us, she had no more ingredients to cook. They still wanted another lomi story; so Jennie suggested that we tried Liam’s, which I had mentioned to her in an earlier e-mail. I sent a text message to my former player Aldo Yuson, whose brother owns the place, to let him know that we were on our way. The production team at Liam's restaurant in Sabang, Lipa City. At Liam’s, they wanted me to give a Lipeño’s perspective on lomi while eating on-cam with Sandy. It would have been petty to have refused; so, I agreed. “Parang kwentuhan lang,” they encouraged me. Unless this segment is edited out, chances are that you will see me when the Batangas episode is aired later this month. From Liam’s, I took the team to P. Torres for their coverage of the Lipa City Night Market. I was feeling flu-y by that time, so I left soon after the market sprung to life. Having never been to the Night Market despite it being on its sixth year, I was fascinated by what I saw in the short time that I was there. There was nothing set up when we arrived; but promptly at a quarter to six, as though somebody pushed a button, the place burst into a hive of activity. Ambulant vendors seemingly coming from nowhere suddenly started to-ing and fro-ing to set up their stalls. It was a compelling sight to watch. Taken after shooting the Liam's segment. What a pity I could not have brought a group of Communications students with me to watch professionals put together a television show. The FoodPrints production team might well have been a group of college students shooting a project video. If, indeed, there was a script, I’m sure it was very loosely written. Yet, watching the replay of the Ilocos episode of the same show, I could not help but admire how professionally the episode was put together. In fact, FoodPrints is a delightful little show; and I cannot wait to see the Batangas episode. Those who wish to catch FoodPrints may do so every Saturday at 8:30pm on the Lifestyle Network, with replays on Sunday at 3:00pm, Tuesdays at 8:00am and Fridays at 2:00pm.